As the air begins to cool off around the nation and with conference play becoming the norm, college football’s regular season is getting ready to hit its stride. We’re beginning to see matchups that will show us which teams are legitimate contenders and which are pretenders for conference championships and the national championship. The first few weeks have put on display a handful of top-flight national title contenders as the quest to find a team capable of beating Alabama is in full swing, but one should never take a week of college football for granted. Could anything crazy happen this weekend that reshapes the way we look at the conference and playoff races later on? Two weeks after watching Texas A&M give Clemson a run for their money in College Station, we once again see Jimbo Fisher see what he can do with the Aggies against one of the nation’s best teams. In fact, we’ll see what he can do against the best team when Texas A&M plays at Alabama this weekend. It’s also the first meeting in SEC play between Fisher and Nick Saban. Fisher vs. Saban is a coaching rivalry that I firmly believe has the potential to be a lot of fun in the coming years. But this year, it may not be nearly as entertaining. Sure, Texas A&M may give Alabama a good run in the first half, but the second half is where the difference between the well oiled machine that is Alabama and the Aggies, which are still in need of a tune-up. Alabama has just been destroying the opposition this season and the Aggies may not have the players and depth it needs to slow down Alabama. Tua Tagavailoa continues to look like a Heisman Trophy favorite at quarterback, so we’ll see how the Aggies play him. It’s fair to suggest Texas A&M will have a few things Alabama has not seen yet because Fisher will be the best coach Alabama has faced yet. But Tagovailoa is the best quarterback Texas A&M has faced too. Alabama likely rolls to another win this week, but this is another opportunity for Texas A&M to add a quality loss to their record. As you no doubt are aware, the three-game suspension to Ohio State head coach Urban Meyer has expired and he will appear on the sidelines for the first time this season when Ohio State hosts Tulane. Say what you will about how Meyer has handled this situation in Columbus, but he is back and ready to lead Ohio State on a path toward a potential Big Ten championship and appearance in the College Football Playoff. Meyer does take the helm of the Big Ten’s best team, even though this weekend they begin playing without one of their best players. 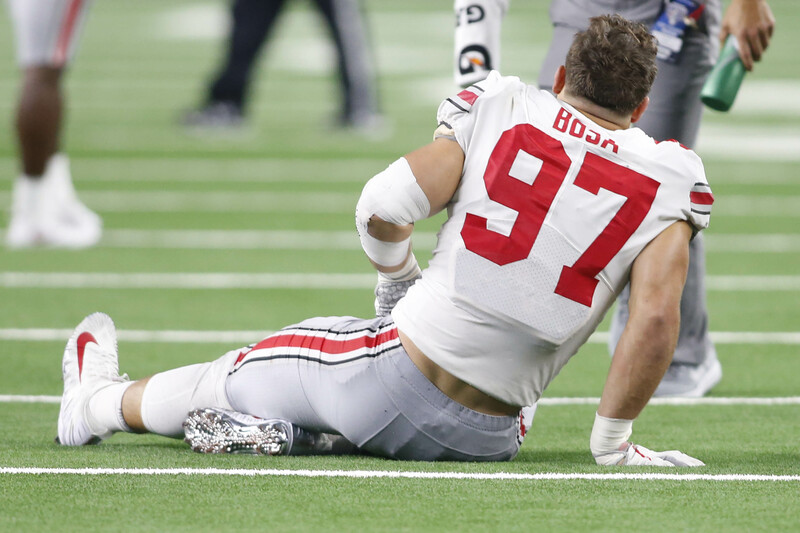 Nick Bosa is out this week and he may be out for quite a bit longer after being scheduled for surgery for a “core muscle injury” suffered in last week’s big win against TCU. That is not a loss that will damage Ohio State’s chances this week and may not even ding their odds to win the Big Ten, but losing one of the nation’s top players is never easy no matter how good your team is. The good news for Ohio State is they have plenty of talent and they have one of the best defensive line coaches in the game in Larry Johnson Sr. Don’t cry for the Buckeyes over the possible extended absence of Bosa (who will likely become the subject of a few columns suggesting he not play again for Ohio State for NFL Draft reasons). Ohio State will be just fine. And if Bosa does make a return at some point, they’ll be even better. After opening the year with a loss to Maryland and a not-so-convincing win at home against Tulsa, the rumblings in Austin were starting to grow a little bit louder by the day for Tom Herman and the Texas Longhorns. But after getting a nice home win against a vulnerable USC team at home, Texas gets a chance to make a statement in Big 12 play. Texas hosts TCU this weekend, with the Horned Frogs coming off that loss last week to Ohio State. Despite the loss to the Buckeyes, TCU managed to impress with their ability and potential to be a really good team. They just didn’t have the horses needed to keep pace with Ohio State once a few things went Ohio State’s way in the second half. But TCU showed a brilliant up-tempo offense that could cause plenty of problems for teams they will play the rest of the season, starting with Texas. Texas had every right to feel good about their win against USC last week, but the Trojans are now 1-2 and there is a chance they could be 1-3 by the time this weekend is over, so let’s not get too carried away. TCU is a much better team than USC, with Shawn Robinson running the offense and Darius Anderson and KaVontae Turpin proving capable of making some big plays happen at any moment. Texas will have their hands full on defense, and TCU’s defense has something to prove as well. TCU will likely have you keeping the finger on the pause button on any “Texas is back” columns this week. Mario Cristobal has Oregon off to a fast 3-0 start and in the top 25 with a quarterback in Justin Herbert beginning to fly his way up the Heisman Trophy radar. Things have been going smoothly for Oregon under the new head coach, but the schedule has been extremely favorable early on with blowout wins over Bowling Green, Portland State, and San Jose State. Is Oregon for real? Should we begin discussing them as a potential threat to Washington? We are about to put that to the litmus test Saturday night. Stanford is making the road trip to Eugene this weekend and will pose the biggest hurdle for Oregon yet. Bryce Love took last week off to make sure he is ready to go this week against the Ducks in a key Pac-12 North matchup. 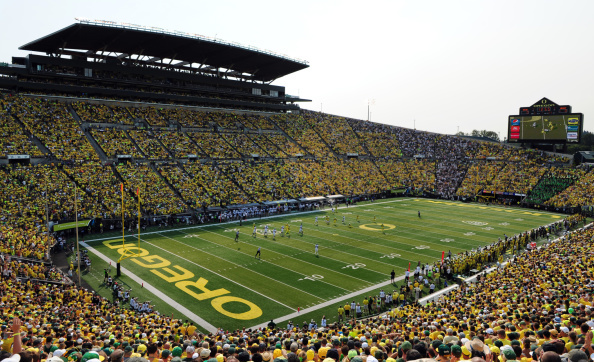 Stanford is the prototypical Oregon-killer with their style of play, but if Oregon can continue to move the football and score some points at home, then the Ducks could force Stanford to get into the type of game they may not want to play. If Oregon sells out to make sure they are not burned by Love, they can flip the game in their favor. This is a big opportunity for Oregon to put the Pac-12 on notice. It’s been a few years since we have been able to say that. The last time that was the case, Marcus Mariota was winning the Heisman Trophy and Oregon was playing for a national championship. Oregon may still have a way to go before they are back in the playoff and national title conversation, but a win against Stanford will show they are ready to make a run in the Pac-12. Of all the top 25 teams in action this week, Wisconsin may be in the least ideal situation. After taking a loss at home last week to BYU, Wisconsin has to rebound on the road in Big Ten play in a stadium that has developed a bit of a legend for being difficult for ranked teams in recent years. Wisconsin opens Big Ten play on the road against Iowa, perhaps the biggest threat to the Badgers within the Big Ten West. Iowa has ruined championship dreams for Penn State in 2008 (and almost again in 2017), Michigan in 2016, and Ohio State last season with upset wins at home in primetime. Wisconsin’s national title hopes took a punch to the gut last week, but one loss is not enough to completely take Wisconsin out of the playoff picture. A second straight loss, however, is a much different situation and likely is an early knockout for the Badgers. And when you consider the similarities between BYU and Iowa, it stands to reason Wisconsin could be in a jam. Like BYU last week, Iowa will have to thrive on a strong defensive effort at home and get just enough offense. The defense was key to upset bids in the past in these situations, but timely passing has always been a major part of an upset against Penn State, Michigan, and Ohio State. This is where Nate Stanley has to be locked in against the Badgers. Stanley had a rough road game at Wisconsin last year so redemption will be a motivating factor. Stanley finally got in rhythm with tight end Noah Fant last week against Northern Iowa, and if that can carry over against Wisconsin, that would be a good sign for Iowa. Focusing so much on what a loss could mean for Wisconsin is fair game, but do not overlook how valuable this win could be for Iowa either. With the current state of the Big Ten West and with the difficult road schedule Wisconsin still faces after this weekend (road games at Michigan, Penn State, and Northwestern), Iowa could gain a lot this weekend with a win by owning a head-to-head tiebreaker with the Badgers and take a one-game lead on the preseason division favorites right out of the gates of the Big Ten schedule. It could be a rough night for Wisconsin.